Nick Crosswell played Super Rugby for Hurricanes, Highlanders and Chiefs. Newport Gwent Dragons lock Nick Crosswell says the Welsh side will be out for revenge when they host Edinburgh in the Pro12 on Friday. 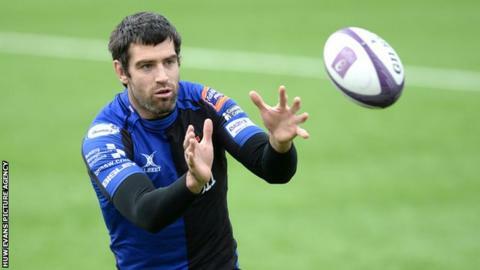 The Scottish side thrashed the Dragons 45-16 in the European Challenge Cup semi-final on 17 April. New Zealander Crosswell, 29, says the Gwent-based side want to get their own back for that defeat. "The good thing about rugby is that you don't have to wait too long for redemption," he said. "We've got a pretty good shot at Edinburgh. "We didn't play very well [in the semi-final] but for 40-50 minutes we were only down by five points, so if we can put sort of 30-40 minutes of good rugby together we'll certainly be competitive [on Friday]." With two games to go, seventh placed Edinburgh are one point and one place below Scarlets who currently occupy the last automatic spot for European Champions Cup qualification. If Dragons beat the Scots heavily and Scarlets gain a bonus point win on Sunday against Cardiff Blues, it could end to Edinburgh's hopes of finishing sixth. NG Dragons: Tom Prydie; Ashton Hewitt, Tyler Morgan, Jack Dixon, Hallam Amos; Jason Tovey, Luc Jones; Phil Price, T. Rhys Thomas (capt), Brok Harris, Cory Hill, Rynard Landman, Nick Crosswell, Nic Cudd, Taulupe Faletau. Replacements: Hugh Gustafson, Lloyd Fairbrother, Dan Way, James Thomas, Ollie Griffiths, Richie Rees, Dorian Jones, Geraint Rhys Jones. Edinburgh: Jack Cuthbert; Dougie Fife, Sam Beard, Andries Strauss, Tim Visser; Phil Burleigh, Sam Hidalgo-Clyne; Alasdair Dickinson, Ross Ford, WP Nel, Fraser McKenzie, Ben Toolis, Stuart McInally (capt), Hamish Watson, Cornell Du Preez. Replacements: Neil Cochrane, Rory Sutherland, John Andress, Anton Bresler, Roddy Grant, Nathan Fowles, Tom Heathcote, Tom Brown. Who needs what in Pro12 title race? Read more on Pro12 2015: Who needs to do what in the final month?